Heart injury: classification, mechanisms and diagnostic problems in chest trauma patients (literature review with the results of own observations) | Интернет-издание "Новости медицины и фармации"
Authors: Курсов С.В., Белецкий А.В., Никонов В.В., Киношенко Е.И. У літературному огляді викладені сучасні уявлення про основні причини та механізми формування міокардіальної контузії в постраждалих із травмою, класифікація тяжкості травматичних міокардіальних пошкоджень й основні способи їх діагностики, зіставлення з рекомендаціями Східної асоціації хірургів-травматологів. На сьогодні найбільш доступними та інформативними тестами при діагностиці міокардіальної контузії в постраждалих із травмою є електрокардіографічний моніторинг, поєднаний з визначенням у крові концентрації серцевих тропонінів. На підставі аналізу результатів найбільш авторитетних сучасних досліджень і власного клінічного досвіду показано, що при підозрі на міокардіальну контузію у вітчизняних лікувальних закладах повинні використовуватися всі доступні діагностичні заходи. У всіх сумнівних ситуаціях подальша діагностична та лікувальна тактика повинна здійснюватися тільки на користь пацієнта. В литературном обзоре изложены современные представления об основных причинах и механизмах формирования миокардиальной контузии у пострадавших с травмой, классификация тяжести травматических миокардиальных повреждений и основные способы их диагностики, сопоставления с рекомендациями Восточной ассоциации хирургов-травматологов. В настоящее время наиболее доступными и информативными тестами при диагностике миокардиальной контузии у пострадавших с травмой являются электрокардиографический мониторинг в сочетании с определением в крови концентрации сердечных тропонинов. На основании анализа результатов наиболее авторитетных современных исследований и собственного клинического опыта показано, что при подозрении на миокардиальную контузию в отечественных лечебных учреждениях должны использоваться все доступные диагностические мероприятия. Во всех сомнительных ситуациях дальнейшая диагностическая и лечебная тактика должна осуществляться только в пользу пациента. The literature review presents current ideas about the basic causes and mechanisms of myocardial contusion formation in the patients with trauma, the classification of the severity of traumatic myocardial damage and the basic methods of diagnosis, the results of comparison with the guidelines of the Eastern Association for the surgery of trauma. At the present day, the most acceptable and informative tests for the diagnosis of myocardial contusion in patients with trauma is electrocardiographic monitoring, in combination with the determination of cardiac troponins concentration in the blood. Based on the analysis of the results of the most highly-regarded modern research and our own clinical experience, it has been shown that in any suspicion of myocardial contusion in domestic medical institutions all available diagnostic measures should be used. In all doubtful situations, further diagnostic and therapeutic tactics should be performed only for the be­nefit of a patient. 1. Blunt Cardiac Injury in the Severely Injured — A Retrospective Multicentre Study / M. Hanschen, K-G. Kanz, Ch. Kirchhoff [et al.] // PLOS One. — 2015. — Vol. 10, № 7. — Access mode: Doi: 10.1371/journal.pone.0131362. 5. RuDusky B.M. Forensik Cardiovascular Medicine / B.M. RuDusky. — Boca Raton — London — New York: CRC Press, Taylor & Francis Group, 2009. — 210 p.
6. RuDusky B.M. Classification of Myocardial Contusion and Blunt Cardiac Trauma / B.M. RuDusky // Angiology. — 2007. — Vol. 58, № 5. — P. 610-613. 8. Medical Legal Implications of Cardiac Contusion — Case Report / D. Dermengiu, M. Ceausu, M. Rusu [et al.] // Romanian Journal of Legal Medicine. — 2010. — Vol. 18, № 2. — P. 82-94. 11. Cardiac Injury in Critically Ill Trauma Patients: a Single Center Experience / D.L. Skinner, J.L. Laing, R.N. Rodseth [et al.] // Injury. — 2015. — Vol. 46, № 1. — P. 66-70. 12. 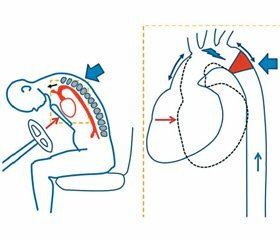 Assessment of Cardiac Contusion in Motor Vehicle Accident Patients / J. Tan, S. Thiagarajan, C. Schultz [et al.] // Heart, Lung & Circulation. — 2017. — Vol. 26, Suppl. 2. — P.102-103. 13. Boxing and «Commotio Cordis»: ECG and Humoral Study / M. Bianco, F. Colella, A. Pannozzo [et al.] // International Journal of Sports Medicine. — 2005. — Vol. 26, № 2. — P. 151-157. 14. Myocardial Contusion after a Professional Boxing Match / P. Bellotti, F. Chiarella, S. Domenicucci [et al.] // The American Journal of Cardiology. — 1992. — Vol. 69, № 6. — P. 709-710. 15. Krexi L. Blow/Trauma to the Chest and Sudden Cardiac Death: Commotio Cordis and Contusio Cordis are Leading Causes / L. Krexi, M.N. Sheppard // Medicine, Science and the Law. — 2018. — Vol. 58, № 2. — P. 93-96. 16. Cardiac Contusion in a Professional Soccer Player. Visualization of Acute and Late Pathological Changes in the Myocardium With Magnetic Resonance Imaging / H. Vago, A. Toth, A. Apor [et al.] // Circulation. — 2010. — Vol. 121, № 22. — S. 2456-2461. 17. Deady B. Sudden Death of a Young Hockey Player: Case Report of Commotio Cordis / B. Deady, G. Innes // Journal of Emergency Medicine. — 1999. — Vol. 17, № 3. — P. 459-462. 18. Montgomery J.A. Commotio Cordis Due to High-Velocity Projectile Ejected from an Industrial Lawnmower / J.A. Montgomery, D.M. Roden // Heart Rhythm Case Reports. — 2015. — Vol. 1, № 4. — P. 172-175. 19. Reduced Diameter Spheres Increases the Risk of Chest Blow-Induced Ventricular Fibrillation (Commotio Cordis) / J. Kalin, C. Madias, A.A. Alsheikh-Ali [et al.] // Heart Rhythm. — 2011. — Vol. 8, № 10. — P. 1578-1581. — Doi: 10.1016/j.hrthm.2011.05.009. 20. Maron B.J. Early Descriptions of Sudden Cardiac Death Due to Commotio Cordis Occurring in Baseball / B.J. Maron, S.D. Boren, N.A. Mark Estes III // Heart Rhythm. — 2010. — Vol. 7, № 7. — P. 992-993. 21. Link M.S. Commotio Cordis: Ventricular Fibrillation Triggered by Chest Impact-Induced Abnormalities in Repolarization / M.S. Link // Circulation: Arrhythmia and Electrophysio–logy. — 2012. — Vol. 5, № 2. — P. 425-432. — Access mode: https://doi.org/10.1161/CIRCEP.111.962712. 22. Upper and Lower Limits of Vulnerability to Sudden Arrhythmic Death with Chest-Wall Impact (Commotio Cordis) / M.S. Link, B.J. Maron, P.J. Wang // Journal of the American College of Cardiology. — 2003. — Vol. 41, № 1. — P. 99-104. 23. Sudden Death Due to the Atrioventricular Node Contusion: Three Cases Report / W. Li, L. Zhang, Ye. Liang [et al.] // Medicine. — 2017. — Vol. 96, № 1. — e 5688. 24. Vascular Surgery / G. Heberer, K.W. Jauch, D.C. Sabiston et al. — Berlin: Springer, Berlin, 2013. — 811 p.
25. Severe Cardiac Trauma or Myocardial Ischemia? Pitfalls of Polytrauma Treatment in Patients with ST-elevation after Blunt Chest Trauma / O. Özkurtul, A. Höch, A. Reske [et al.] // Annals of Medicine and Surgery. — 2015. — Vol. 4, № 3. — P. 254-259. 27. Yousef R. Blunt Cardiac Trauma: A Review of the Current Knowledge and Management / R. Yousef, J.A. Carr // Annals of Thoracic Surgery. — 2014. — Vol. 98, № 3. — P. 1134-1140. 28. Eiferman D. Cardiac Trauma / D. Eiferman, R.N. Cotterman, M.S. Firstenberg // Principles and Practice of Cardiothoracic Surgery; chapter 13; edited by M.S. Firstenberg — London, United Kingdom: InTechOpen, 2013. — P. 339-353. 29. Cardiac Contusion and Hemopericardium in the Absence of External Thoracic Trauma: Case Report and Review of the Literature / J. Gonin, G.L. De La Grandmaison, M. Durigon [et al.] // American Journal of Forensic Medicine and Patho–logy. — 2009. — Vol. 30, № 4. — P. 373-375. 31. Петровский Б.В. Протезирование клапанов сердца / Б.В. Петровский, Г.М. Соловьев, В.И. Шумаков. — М.: Медицина, 1966. — 231 с. 36. A, B, C, D, Echo: Limited Transthoracic Echocardiogram Is a Useful Tool to Guide Therapy for Hypotension in the Trauma Bay-a Pilot Study / P. Ferrada, P. Vanguri, R.J. Anand [et al.] // Journal of Trauma & Acute Care Surgery. — 2013. — Vol. 74, № 1. — P. 220-223. 37. Cardiac Injuries: A Review of Multidetector Computed Tomography Findings / A.J. Baxi, C. Restrepo, A. Mumbower [et al.] // Trauma Monthly. — 2015. — Vol. 20, № 4. — e19086. 40. Troponin I., Troponin T. CKMB-Activity and CKMB-Mass as Markers for the Detection of Myocardial Contusion in Patients Who Experienced Blunt Trauma / J.C.J.M. Swaanenburg, J.M. Klaase, M.J.L. De Jongste [et al.] // Clinica Chimica Acta. — 1998. — Vol. 272. — P. 171-181. 42. Identifying the Broken Heart: Predictors of Mortality and Morbidity in Suspected Blunt Cardiac Injury / B. Joseph, T.O. Jokar, M. Khalil [et al.] // American Journal of Surgery. — 2016. — Vol. 211, № 6. — P. 982-988. 43. Normal Electrocardiography and Serum Troponin I Le–vels Preclude the Presence of Clinically Significant Blunt Cardiac Injury / G.C. Velmahos, M. Karaiskakis, A. Salim [et al.] // Journal of Trauma. — 2003. — Vol. 54. — P. 45-50. 44. Evaluation of Incidence, Clinical Significance, and Prognostic Value of Circulating Cardiac Troponin I and T Elevation in Hemodynamically Stable Patients with Suspected Myocardial Contusion after Blunt Chest Trauma / J.P. Bertinchant, A. Polge, D. Mohty [et al.] // Journal of Trauma. — 2000. — Vol. 48, № 5. — P. 924-931. 45. Rajan G.P. Cardiac Troponin I as a Predictor of Arrhythmia and Ventricular Dysfunction in Trauma Patients with Myocardial Contusion / G.P. Rajan, R. Zellweger // Journal of Trauma. — 2004. — Vol. 57, № 4. — P. 801-808. Травматический некроз или травматический инфаркт миокарда?